Achieve enviably hydrated skin, reverse sun damage and diminish fine lines and wrinkles with Sodashi’s most indulgent anti-ageing body product yet! This aromatic, eco-luxe body cream absorbs quickly and leaves the skin gorgeously soft, silky, firm and soft, all while calming and soothing the senses. 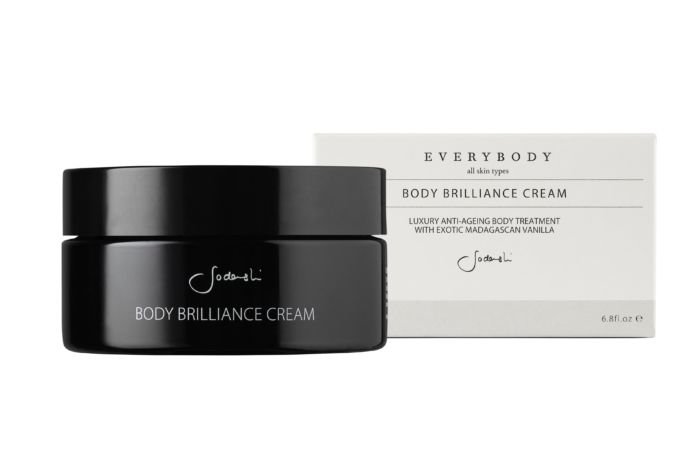 A beautifully hydrating, botanical body treatment, Body Brilliance Cream has an exquisite whipped texture that melts into the skin and a blend of rich Madagascan Vanilla, exotic Ylang Ylang, Patchouli and Avocado Oil combine to give it a delicious aroma. aqua (purified water), simmondsia chinensis (jojoba oil), cetearyl alcohol (plant derived), cocos nucifera (coconut oil), butyrospermum parkii (shea nut butter), persea gratissima (avocado oil), shorea robusta (sal butter), mangifera indica (mango butter), tocopherol (vitamin E), benzyl alcohol, potassium sorbate, vanilla oleoresin (vanilla), citrus paradisi (grapefruit), salicylic acid, cananga odorata (ylang ylang), pogostemon cablin (patchouli), styrax benzoe (benzoin siam resin), citrus grandis (grapefuit seed extract), glycerine, sorbic acid, jasminum grandiflorum (jasmine).